Legislation introduced in Congress last week would provide paid leave for federal civilian employees who have or adopt a child for the first time. The Federal Employees Paid Parental Leave Act (H.R. 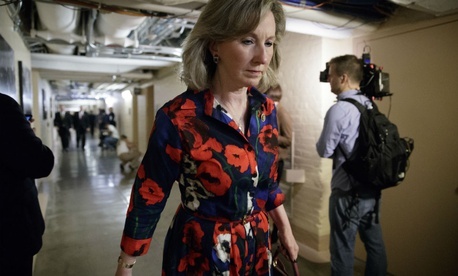 6275), introduced by Rep. Barbara Comstock, R-Va., would provide federal workers 12 weeks of paid leave following the birth, adoption or fostering of a child. Currently, feds may take up to 12 weeks of parental leave, but it is unpaid. In a statement, Comstock said the measure would bring federal agencies more in line with benefits offered in the private sector. National Active and Retired Federal Employees Association President Richard Thissen applauded the bill’s introduction in a statement. The bill marks the latest of a long string of efforts, thus far unsuccessful, to provide federal workers with paid parental leave. Last year, Rep. Carolyn Maloney, D-N.Y., introduced a bill that would provide six weeks of paid leave to feds who are new parents, with an option to take an additional six weeks of unpaid leave. Meanwhile, the Office of Personnel Management last week announced a new process for agencies to review their human capital goals in an effort to update procedures to better align with agency strategic goals. In a memo to agencies, Mark Lambert, OPM associate director for merit system accountability and compliance, and Mark Reinhold, associate director for employee services, said agencies should highlight both accomplishments and “concerns and needs” as part of their reviews. “Taking an evidence-based approach, the discussions will focus on agency human capital programs and the design and use of their Human Capital Operating Plans, HRStat, and Independent Audit Programs to improve human capital planning and outcomes in support of organizational performance,” the memo stated. According to OPM, the process will involve discussions between agencies and OPM officials, and culminate in the release of an annual report on governmentwide HR practices, as well as a new Federal Workforce Priorities Report every four years. Over at the Federal District Court for the District of Columbia, a group of four current and former lawmakers from both parties have filed an amicus brief in support of federal employee unions’ legal challenge against President Trump’s recent executive orders that seek to make it easier to fire federal workers and curb the influence of labor groups. In the filing, Reps. Elijah Cummings, D-Md., and Peter King, R-N.Y., and former Reps. Bill Clay, D-Mo., and Jim Leach, R-Iowa, argued that the executive orders run contrary to a number of key aspects of the 1978 Civil Service Reform Act, at times citing Clay’s own comments in support of the law during the House floor debate on the measure. In recent weeks, the American Federation of Government Employees, one of 15 unions party to the recently consolidated lawsuit, issued a second lawsuit challenging two of the executive orders. In the new complaint, the union argued that the White House’s efforts to exclude firings and adverse personnel actions from grievance procedures run against the CSRA, and that the order aiming to shorten collective bargaining negotiations seeks to circumvent procedures enshrined in existing law.